Part of my own Druid’s Garden! One of the greatest blessings of gardening and growing things is the deep energetic connections that you can develop with plants. When I grow a pepper in my garden, I have developed a relationship with that plant from the time I planted the seed in February, where I tend it and keep it sheltered from the winter weather, to the planting and mulching of that small pepper in late May. This relationship continues as I nurture it into maturity throughout the summer, where flowers and the actual peppers start to emerge. I monitor that pepper plant for insects and disease and do what I can to ensure its success. Finally, I watch the peppers grow large and fat in the heat of the summer. At that point, I have an eight-month relationship with that pepper plant. When I eat the pepper in late August, I know where it came from, and just as importantly, I’ve developed an energetic connection with it. When I save the seed from that pepper for next season, the relationship becomes even stronger. The pepper will not be casually wasted, given how much energy has been put into it. We are connected; that connection is sacred. The connection is rooted in the time, the hard work, and the co-dependence that I create with the plants. This isn’t a lesson that I would have ever understood had I not started growing and preserving some of my own food and in dedicating myself to gardening as a sacred practice. You wouldn’t know the difference between a factory farmed pepper or your home-grown pepper if the factory farmed pepper is all you’ve ever eaten. Someone growing up in a non-industrialized culture from birth would learn to recognize and nurture that sacred connection between the human and the soil, and the codependency that connection provides. However, for people growing up in western industrialized cultures, not only do we not have the connection—we don’t’ even realize one is missing. Whether we are growing in pots on our porch or in a big garden, all gardens offer us opportunity for these connections. It is in these gardens that we can begin to cultivate and to understand the sacred: a sacred awareness of the plants and their cycles; a sacred awareness of the magic of the seed and the soil; and a sacred awareness of our relationship to the growing things, the mystery of life. In order to think about sacred gardening, druid gardening, I’ve developed a “wheel of principles” that help me make decisions about my garden. Some of these are rooted in permaculture design, others are more druidical in nature, still others are insights I’ve gained over the years of living and working with this approach. Think of the wheel of principles like general ideas to think about or guidelines; ways of ensuring a sacred experience while you are starting to tend your plants for the coming year. This basic magical principle, derived from hermetic magical practice, is perhaps best epitomized by the magical adage, “As above, so below, as within, so without.” The underling idea here is that what we do on the inner planes (that is, realms of experience beyond the physical), has a direct impact on the physical plane. Similarly, what occurs on the outer planes has an impact on the physical. This also applies to us as people—the inner work we do (reflection, meditation, journeying, ritual) impacts our outer living; and vice versa. In the disenchanted world we live in, the non-physical, spiritual aspects to various activities are simply not considered—gardening is no exception. We’ll be working with this principle in every chapter of this book—it is cornerstone to sacred gardening. Nature provides us an incredible amount of lessons and patterns to work with—by studying nature, we learn all we need to know about how to live regeneratively. This was the basic practice that allowed permaculture design to develop, and its similarly the basic understanding that drives our actions. A big part of the challenge with harmony with nature is that a lot of people don’t know how to live harmoniously any longer, and many of the other principles in this chapter and this book give clear guidance in how to do so. The most basic principle to sacred gardening is to create a landscape that is in harmony with nature, rather opposed to it, and to create a landscape that produces yields beyond food for the human being. Yes, you read that might—sacred gardening is about much more than vegetables, and embraces the permaculture ethical principles of earth care, people care, and fair share. This requires us to question everything we know, or think we know about growing plants, to reject the urge to consume, and to throw out a good deal of the “conventional” wisdom that has been ported into our heads in the name of consumerism. This is because most conventional wisdom has a price tag attached, and rarely is anything you purchase to put in your garden from a big box store is healthy to you or to the land. We think of a “yield” from a garden, the amount of vegetables, fruits, and herbs you can harvest is likely the first (and possibly only) thing that comes to mind. But if we are thinking about gardening as a regenerative practice for our lands, earth care also is critical. This means that our yield can also be habitat, nectar, improved soil fertility, improved biodiversity, better water retention, beauty, community, a place for meditation and prayer, and so many other things. In other words, if we extend our idea of what a yield from the garden looks like, then we can yield as much for the land as four ourselves. This principle is also derived from permaculture design. It suggests that each element can serve multiple purposes. For example, meditation works for calming the mind, focused thought, relaxation, and spiritual development (that’s at least four functions). My chickens produce eggs, create compost from household and garden waste, provide enjoyment and companionship, and reduce problematic insect populations. When we engage in sacred action, we can use this principle to help us find activities that allow us to address more than one purpose. Think about what you are planting and its relationship to everything else. Permaculture design asks us to de-compartmentalize our thinking and realize that everything is connected. Many plants do well with certain companion plants (as epitomized in the book title Carrots Love Tomatoes) but not necessarily with others. Certain herbs and plants, like chives, lavender, nasturtium, and garlic, can ward away pests and critters, eliminating the need for chemical deterrents. A garden hedge of wildflowers that bloom different times can provide beneficial insects homes and food—these insects help keep the pests down in your garden. Even within a home, thinking about these principles can be used to create systems that require little inputs—home aquaponics is a fantastic way to grow tons of fresh vegetables—just feed the fish! Composting not only reduces food waste and what goes into a landfill, it provides incredible finished compost for use in the soil. We see here the idea of both embracing diversity and building an ecosystem and making sure each plant in that ecosystem is chosen carefully to have multiple functions when possible. Stemming from the idea of earth care, one of the major issues we have in industrialized culture is an over-dependence on fossil fuels and other non-renewable sources of energy and goods. The truth is, we have finite resources on this planet; things that are renewable or free (like the sun or wind for energy) are better than those that are not (like coal for energy). This principle is derived from permaculture design, but it also can be found in many other places. This principle asks us to consider diversity in our designs. We might think about this in terms of polycultures rather than monocultures. A perennial garden is more diverse and resilient—it can handle pests, disease, and drought much better than a monoculture cornfield. Monocultures refer to a single plant (like a field of soybeans) while polycultures refer to many plants sharing the same space. Polycultures are found all throughout nature; monocultures generally are not. Polycultures can work together, where different plants accumulate nutrients (dynamic accumulators), fix nitrogen, provide forage and nectar for insects, provide food for the gardener, and so on. Monocultures do not regenerate the soil, they do not provide a healthy or balanced ecosystem, and they encourage explosions of certain kinds of pest populations due to the concentration of many of the same plant in an area. The largest monocrop grown in the USA is the lawn; but many other monocrops are also present (wheat, corn, soy, etc). Mimicking nature and using nature as our guide, we can shift from cultivating monocrops to polycultures. Along with this, we might carefully consider what that we plant and those plants’ relationship with the land. Annual agriculture (that is, your typical plants like tomatoes, corn, zucchini, beans, and so on) require the yearly work of bed prep, weeding, sowing, seed starting, and harvesting—this disrupts soil ecology and causes extra work. Shifting to use at least some perennials in your growing means that the plant is planted once—and only once—and then the soil is not disrupted again and the plant can grow and be abundant. Most of our most balanced ecosystems occurring in nature have more perennials or self-sowing annuals than the tender annuals we typically use as food crops. Entire books are written on this subject (see resources, Appendix A), so I won’t go into too much depth here. But if we are thinking about building an ecosystem, we should consider the role of our perennial crops—herbs, nuts, fruits, berries—in that garden. Reflective activity, when we simply stop what we are doing and carefully think and meditate on our actions, is a cornerstone of sacred action and its used in nature-based spiritual practices as well as permaculture. Quite contemplation (through discursive meditation, discussed in Exercise 1 below, or simply sitting quietly and pondering), is critical for this kind of work. Revise, here, suggests that if we spend time periodically really thinking through and reflecting upon what we are doing, new insights may arise that we will be able to employ in our sacred action. Revise here also implies that not being too committed to any particular approach is good—revision is a process where we shape and hone earlier ideas into something better. Sometimes, it takes us working through a project or meaningful change partway before we see a better way we can do something. A sacred, sustainable garden is not a fast process. The soil takes years to establish, the seeds take time to grow, perennials, trees and shrubs take time to bear fruit, compost takes time to make, all these stress time and patience. Just as importantly, we have to grow our knowledge to really achieve the kind of relationship with the land that we want to have. The idea that we’ll have a perfect garden in one season is simply not realistic. Like the tree that takes years to bear fruit, we must also realize that gardening, like other forms of growth, takes patience and time. Even growing sprouts on your counter, which is about the easiest way of growing anything, requires patience and time (in days, rather than weeks, months, or years). Understand that sacred gardening is a learning process and the best way to learn is to constantly educate yourself. Take classes, help friends, visit farms, read books, watch videos—anything that will give you new perspectives on growing food. You can see a complete list of books to get you started in the appendix. This is another principle derived from permaculture design. Waste is a resource that has not been given a proper place—we can think about “waste” in new ways. Human waste and urine, for example, can safely be used as a fertilizer under certain conditions. Producing no waste goes far beyond recycling! When it comes to growing things, we want to make sure that everything that we grow does not go to waste and whatever nutrients are in the soil go back if at all possible. I am always saddened when I go out for bags of leaves in the fall and find whole bags of plants ripped up from someone’s garden in the brown “compost” bags they place on the curb. After spending a whole season with the plants, my neighbors would rather send them “away” than make a compost pile and add those nutrients back into the soil. These same people then go to the store and buy bags of compost and fertilizer (again, demonstrating the consumer mindset of consumeà throw awayàconsumeà throw away). I think this practice demonstrates how little modern people really understand about growing our food from a permaculture-informed and ethical perspective. Consider any waste streams that can be integrated into a gardening system, like composting. Even for those growing food inside their homes, a worm composting system combined with container gardens can make use and re-use of many nutrients. For those on the more radical side, humanure (that is, composting your own waste) is always an option! Even when I’m growing sprouts on my counter, I save the water from rinsing to water my other house plants—again, turning “waste” water into something needed. Rather than starting big and going all out, we create small, slow solutions that allow us to build upon success slowly from within. You might think about your own path as that of spiraling slowly up a mountain. You don’t climb a mountain all at once and you certainly don’t do it without preparation, ongoing evaluation, and occasional breaks. Unexpected issues—and opportunities—can arise as part of the climb. With each step you get further along and deeper into the practice. The other way of climbing is kind of moving along, bit by bit, and then suddenly looking out and realizing you are way higher than you thought! Shifting to regenerative practices are really no different: when we begin the ascent, we have a lot of energy and enthusiasm, but we also have to take our time and make sure what we are enacting is permanent and self-sustaining or our efforts are in vain. Or, we might find that in our many daily meanderings, we are doing more than we realize. Both are valuable insights! One of the biggest mistakes that new and enthusiastic gardeners and sacred activists do is to go crazy, convert a huge portion of their land to various gardens in one or two seasons, and then be overwhelmed with the maintenance of those gardens. This is exactly what happened to me on my homestead—within three years, I had all but eliminated an acre of lawn and replaced it with perennials, an annual vegetable garden, herb gardens, fruit trees, and more. And while it was incredible and diverse and all of the things I’m writing about in this section—it was also way too much for me to manage. This example nicely illustrates the concept of spiraling changes: start small, work slow, and allow things to naturally unfold. See how it is managing a small garden (maybe 2 4×10’ beds) and build accordingly. Consider perennials for less intensive management over time as well. Gratitude is something missing from our everyday lives in industrialized culture, and bringing gratitude back into our actions is useful in all cases, and certainly, in a garden. Gratitude practices for me include developing shrines to honor nature and her spirits, making regular offerings, respecting the plants and life itself with respectful planting, harvesting, and so on. These are some–of many principles–that I try to live and grow by with my own relationship to the living earth. I hope you find something in here worth taking with you–and gardening with this year! I’d love to hear from you on other principles for sacred gardening that you use! Druidry is rooted in relationship and connection with the living earth: the physical landscape and all her plants and creatures, the spirits of nature, the allies of hoof and claw, fin and feather. The land and her spirits are our primary allies and energies with which we work as druids. The question I keep coming back to is this: how do I practice a nature-centered path in a time when nature–those of the hooves, fins, feathers, and claws–are going extinct and dying all around me? How do I practice druidry when everything that I hold sacred and love is under severe threat, and when it is likely that in my lifetime, I will witness severe ecological collapse in multiple ecosystems. How do I practice druidry with my “eyes open” to all of this, and honor nature in this great extinction event, and still say sane? How do I do this “druid” thing, given these challenges? Druidry in the 21st century is a complex topic, and I’ve been trying to work my way into it in different ways on this blog. I started this by thinking about how druidry offers coping mechanisms for those of us faced with the many challenges of our age: that is druidry offers refuge in dark times. I think it’s critically important to acknowledge that first and foremost, we need self care to do it well. While all humans need self care in these dark times, our spiritual relationship with nature requires it. I followed this up with a post about the future of human civilization (Druidry for the 21st century) and made the argument that one way druidry may serve the future is through developing and providing paradigms and mindset shifts. The idea that druidry is the seed of something different; that druidry offers us new paradigms and hope; paradigms to replace the thought processes and civic ideals currently driving post-industrial civilization to the brink of global collapse. These are two useful responses, but they certainly aren’t the end of this conversation–not by a long shot. So today’s question is a serious one: What can druids do about what is happening to all of nature now and what will continue to happen in the foreseeable future? Today, then, I’m going to talk about death. I’m going to talk about nature and relationship, and I’m going to talk about extinction. Maybe you want to stop reading at the words “death” and “extinction”; these are things we don’t talk about. These are things our media refuses to cover. These are things overwhelming to even well meaning people, people who love the land, people like you and me. These are things that bring tears to my eyes when I read them or think about them. But it is necessary that we honor and acknowledge those parts of nature that are no longer with us; that are dying and may never return because of human indulgence. To avert the eyes is essentially allowing a loved one to suffer alone. If your grandmother were dying in a hospital, would you ignore her, or would you go visit her? (For more on my idea of “palliative care” and why witnessing is so important, see here and here). If your sacred companion on the druid path–nature–is suffering and dying, can you really pretend everything is ok? I don’t think I can just go into my woods and do some woo-woo and get healed by nature and call that druidry. Druidry is not a one-sided relationship. If we want to gain our strength, wisdom, peace, and healing from nature, we must also offer something in return. I believe that now–in the 21st century, in the Anthropocene, nature needs us just as much as we need her. So let’s start with the hard stuff. Scientists are clear that the world’s sixth extinction-level event is underway. “Biological annihilation” is the phrase used to describe what is happening–since 1970, at least half of the world’s animals are gone. That means that we had twice as many animals living on this planet in 1970 than we do today. This isn’t some far-off future prediction. It has already happened. It is continuing to happen as you read this. It has happened in the time that you have been present on this earth. Here’s a list of the “recently extinct” species–those who have gone extinct primarily since industrialization. There are many more who are not on this list because they weren’t discovered or documented before going extinct. A 2017 study, examined 27,600 land species and found that all species were showing huge amounts of population loss, even among species of the “lowest concern” with regards to the International Union for the Conservation of Nature’s guidelines (which sets guidelines for endangered species). This study suggests that 80% the traditional territories of land mammals have been eradicated, making way for cities, people and shopping malls–this is the “biological annihilation” that they speak of. The study also indicates that this trend will likely increase in the next two decades with the rise in population and continued rising demands on the earth. Another piece of this comes from the work of Bernie Krause, who wrote The Great Animal Orchestra (which I discussed a few years ago on this blog). Krause’s work focused on recording nature sounds, and he demonstrates that the sounds of nature are simply vanishing, along with the life and species. These issues are also not limited to vertebrate species–another study, released in October, showed a 75% decline in insects in protected ecological areas in Germany. The problem isn’t that change is happening; the problem is that it is happening so quickly that natural evolutionary processes (processes that allow species migrations and adaptations) cannot occur. And so, how do we honor those animals, plants, insects, trees, amphibians, reptiles and so forth that have passed, many unnoticed? One more piece here, that I think is critical to consider. All ecosystems have what is called a “carrying capacity.” That is, given the resources available (sunlight, soil, plant matter, water, weather, etc) the land can reasonably sustain so many lives of different kinds: so much insect life, so much plant life, so much animal life, so much human life. Ecological collapse refers to when an ecosystem suffers a drastically reduced carrying capacity–that is, the ecosystem can no longer support the life it used to because of one or more serious factors. These factors are usually compounded and may include the loss of a keystone species, general pollution or degradation, deforestation, ocean acidification, over-hunting, you name it. Its like a domino effect–sometimes, all it takes is one core species to go. Climate scientists call this the tipping point–think of it like a chair. The chair is being held at 45 degrees, and just a fraction more, and it will crash. It is almost certain that we are heading into a nose dive of ecological collapse. Ecological collapse doesn’t just affect all of nature–it affects humans too. So while we should care about even one life, a single species, we also need to be concerned deeply for all life. This will happen in our lives–how do we spiritually prepare to support nature when it does? Now, put this in context. While we practice druidry, while we enjoy nature’s benefits and her healing, this is happening. When we are honoring nature, celebrating the wheel of the seasons, this is happening. Its happening in every moment of every day. This is part of our reality, as nature-honoring people. Given that this is the reality, responding to this should also be part of our druid practice. Druidry is about nature and relationship. Its about your relationship with nature both exoterically (that is, in the material world) and esoterically (that is, in the world of spirit). In the case of this information, I think it’s really important that we develop a range of responses, both esoteric and exoteric. In terms of the outer world, I’ve long advocated on this blog a very wide variety of things that can aid the land in healing, regeneration, and growth. I think that each of us can do something, and that something varies based on our life circumstances. All of us can attend to our ecological footprint, consumption behaviors, transit, energy use, and all of the usual things. I think that’s part of just being a druid–living your practice. To be more specific to the material above, however, I’ll share what I consider to be my key method for responding this kind of extinction level event: building refugia. Refugia is a concept discussed by E. C Pielou in After the Ice Age: The Return of Life to Glaciated North America. In a nutshell, refugia (also called “fuges”) are small pockets of life that were sheltered from broader changes that destroyed most habitats. Pielou describes specific isolated pockets of life that survived as a sheltered spot, a microclimate, a high point, and so forth, while the rest of the land was covered in ice. When the glaciers receded and left a bare landscape devoid of topsoil or life, it was these refugia that allowed life to spread outward again, repopulating areas in North America stripped bare by glaciers. Of course, Refugia aren’t limited to North America–they are a worldwide phenomenon, and even our human ancestors, at various points in our history, have used them to survive challenging environmental conditions. In the 21st century, in the time of human-dominated land use, things are not as different as you might think from our glaciated pre-history. For one, the loss of biodiversity and essentially inhospitable landscape can be found in the 40,000,000 acres of lawns currently in cultivation in the US or the 914,527,657 acres of conventional farmland in the US. Many areas that aren’t lawns or farmlands are subject to other kinds of stresses that create inhospitable lands: pollution, resource extraction, deforestation, and so on. Refugia allow us to create small pockets of biodiversity–which is going to really, really matter in the next 20-30 years. Refugia are all about individual action. While no average person has control over what much of what is happening in the world around us, even in the landscape around us locally, we can create refuges for life. Refugia are small spaces of intense biodiversity, critically important during this time of mass extinction and habitat loss. Cultivating refugia allows us to put more of the building blocks back into nature’s hands for the long-term healing of our lands. That is, refugia is that they are little arks of life, that is, little places where biodiversity and life can spring forth once again. A network of refugia created by 21st century druids may be the difference between extinction and thriving for many diverse species. What you do can make an incredible difference–it could save a species. I have written more about how to create a refugia garden here and here! Given the state of nature and that we practice a nature-oriented spiritual practice, I think it is necessary to directly honor the massive loss of such life through rituals, shrines, moments of silence, psychopomp work, and other practices. I would argue that this work should be a regular part of our practices as druids. I’m going to share two ideas here, and next week, I offer a larger set of suggestions on psycopomp work for the animals and the land. Anytime I open a sacred grove to do ritual, I have begun with a simple sound ritual to honor the life that has passed. I have a small singing bowl, and I go to each of the quarters and ring the bell in each direction. Sometimes I do this silently, and sometimes I say some simple words, like “honoring those who have passed on in the east.” I allow the bowl to resonate until it is completely quiet again, and then move on to the next direction. I’ve found for typical OBOD or AODA grove openings, this is best done just after declaring peace in the quarters. You don’t have to do this in ritual; you can do it anytime. I like doing it in ritual because it is in ritual that I’m drawing upon the land and her energies, and I want to honor and acknowledge the suffering of the land before I ask for anything else (that’s why I do it early in the ritual rather than after I’ve called the quarters and established the space). I also maintain two shrines–an indoor shrine and an outdoor shrine–to honor the many lives that have passed. I often will do my sound ritual above and leave small offerings (like my offering blend). These shrines are simple–a pile of stones outside on a stump, I add bones and other things as I find them on my walks. Indoors, I have smudges I make special for this shrine, usually of rosemary (for remembrance), bay laurel (for passage), white cedar (for eternal life), and white pine (for peace) and I burn these regularly. I sometimes print out pictures of animals or other species, and add other things of significance. Like most things, it is the intention of this shrine that is critical. At least once a year, if not more frequently, I also like to engage in ritual (group or solo) to directly honor and support the land. One of my favorite things to do with this comes from the work of Joanna Macy (who has many great ideas for group rituals and group healing and processing of what is happening now). She has a ritual called the Council of All Beings (the link will take you directly to the ritual). I like this ritual because it allows us to give voice to those who do not normally have it, and it helps all participants get into a frame of mine that acknowledges and honors other life’s suffering. I think its important to engage with this not only for ourselves, but with others–talking about it, sharing what we do, and working on doing some things together. I also think that general land healing and blessing ceremonies are useful and important to do regularly and help energetically support the land and her spirits during this time. I wrote a series on land healing; this final post links to all others. There’s so much more to write and say here, but alas, I think this post is long enough. Dear readers, I hope you will share some of your own thoughts–how do you answer the many questions I’ve posed in this post? I would love to hear your ideas and stories. 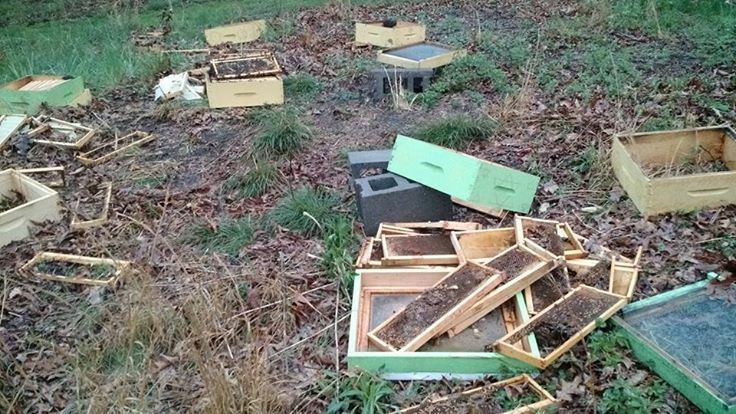 My last beekeeping post told a the tale of my two bee colonies destroyed by colony collapse disorder. I had hoped to have better news to share about my beekeeping endeavors this year. And things started well enough: a friend removed some bees from a house that was to be torn down and gave them to me; I moved my hive to a new location and setup the hive in a friend’s yard, and then I was able to setup an empty hive with the hopes of catching a second swarm. But, unfortunately, this tale has a different end, and a different lesson. The bees were doing great, I had just added honey supers a few weeks ago, and I was expecting a ton of honey from such a strong colony and then–the bear came. I have read about bears taking out beehives, but I have never talked with anyone that had this happen. My friend had never seen a bear, and there were no reports of them in the area, but clearly, one was nearby! The bear ripped open the hive, and, in the middle of a rainstorm, flung the colony all over the place as he had his meal. Bears go for honey, but especially, for the brood: the bees’ young larvae and pupae are very protein rich. And so, this was the scene that greeted my friend when she woke up, and the scene that greeted me when I arrived to see what could be salvaged. Two of us worked for most of the day to salvage what we could. The bees that remained were soaking and, since it was only about 50 that day, very cold. The equipment was soaked, and I had no idea if the queen had survived. I thought it likely the bear would return, so I spoke to various friends in a desperate effort to move the hives before dark. I wasn’t able to secure a location, and since it is illegal to have bees inside of town limits, we instead drove many pieces of rebar around the hive, wired it up, strapped it shut, and hoped for the best. I wish now I had just stuck them on my porch for a day or two until I could figure out where to move them and risked the citation. Unfortunately, the bear came back, and while we made it harder for him to get inside, he still did, demolishing what was left of the hive. The end of this tale is a bit better–although there weren’t many bees left after the second bear visit, we salvaged what was left: the queen and about 5000 of her workers. We borrowed a travel box from a friend, and we saved every bee we could, gently helping them into the hive box. A fellow beekeeping friend has a number of hives, so he had brood and resources to help them get back to health. They are now back on their way to a strong colony again, and they are protected from bears. All the beekeepers in the area are on alert now about bears, thanks to my hive. This whole event has given me much to think about and meditate upon, and a variety of lessons to consider–and today, the lesson is honoring the predators. It’s ironic that this the lesson I am exploring, because the the hives were torn apart on the early morning hours of May 2nd. The day before was May 1st – Beltane. I met with a new friend, a woman who had dedicated her life to the work of the goddesses, and we got together to do a Beltane ceremony. As part of our first ceremony, each of us brought some things from our respective traditions to share with each other. One of the things she brought were offerings, including an offering honoring the predators. She made her offering and spoke beautifully about the predators, their role, the goddesses connected to them. In my mind, I was certainly not honoring the predators. All of my experiences with predators as a homesteader were negative: the hawk that swooped down to kill many of my dear chickens, including taking a peep right from in front of me. The dead chicken bodies I found as the hawk flew off after eating a meal. I remember the evidence of the badger that ripped my coop open one night and drug off my beloved rooster (an event I still haven’t written about), the snakes by the pond swallowing frogs whole, their peeping and screeching noises going on for over an hour till the snake finally finished its meal. As my friend spoke so beautifully about the predators, I was instead filled with these images of predators and how I spent so much of my own time over the last few years keeping them away from things I loved. And then, that next morning–the largest predator of all in this area–the bear–came and feasted upon my beehive. I have reminisced in the weeks that have passed since the hive was eaten that I really do have a problem honoring the predators–and that’s a problem with me, not a problem with the predators. And the predators, in their own way, will make themselves known and continue to show up in my life until I am able to honor them. And so, to help myself come to terms with the loss, I thought I’d write about the predators and, finally, begin to do the work of honoring them. We learn about predators in school in really scientific ways: predators sit at the top of the food chain; they are carnivorous, eating only the flesh of other creatures; they may be solitary or run in packs. We learn about predators from the local news: a hiker was mauled by a bear, a swimmer was eaten by a shark, a pack of coyotes killed a number of neighborhood dogs. We learn about human predators, who we view as the worst kind of people: those who stalk, kill, harm and maim others. This, term perhaps shows us the cultural view of the predator, that we take this term and we attach it to heinous actions that are in no way comparable to a bear or a fox taking a meal. I think I was viewing the predators that had eaten the bees, the chickens, and so forth in the same way: you, predator, have taken something I value, you have taken a life. You have done me wrong and have done wrong to others. But this is not the lesson of the predator, not the lesson at all. Sometimes, those of us, especially those in nature-based spiritual paths, want to see nature as all roses, all pretty trees, all little birds signing. But roses have thorns, the trees compete for light, and the birds sometimes knock each other’s eggs out of nests. Like everything else, they are working to survive by any means possible. A forest is full of both competition for resources and cooperation. I’m reminded here of the lesson of the many medicinal mushrooms of the woods (and you can read some of this in Tradd Cotter’s book; he gave a fascinating talk on this subject last year at the Mother Earth News Fair in Seven Springs, PA.) The medicinal qualities–particularly the anti-cancer, anti-microbial qualities–of mushrooms like birch polypore, turkey tail, or reishi are based on their growth in natural environments, where mushrooms have to compete to survive. Tradd gave an example in his talk of a petri dish that he was working on that had birch polypore in it–he had dropped something nasty into it (e-coli, I think) and was amazed to see how the birch polypore exuded an anti-fungal agent to combat it, and surround it, and eventually subdue it using what was essentially chemical warfare. That same chemical constituent, when taken within, helps us fight a number of diseases. 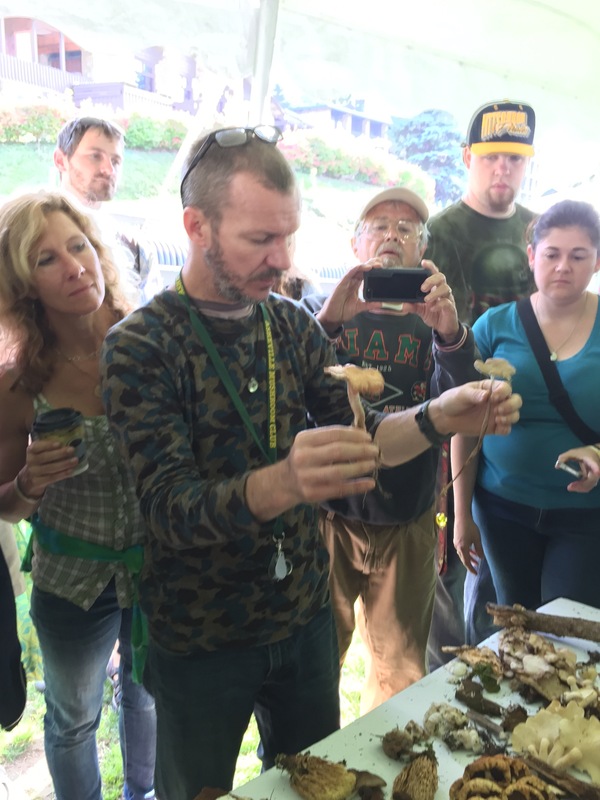 If the mushrooms are grown in a lab or in a controlled setting, their medicinal value drops significantly–because they don’t have the natural competition of all of the other bacteria and others in the fungal kingdom. These mushrooms aren’t predators in the traditional (animalistic) sense, but they certainly have similar qualities and offer similar lessons. The truth is, predators are a key part of nature, and without them, we lose a greater part of the whole and the entire ecosystem suffers. Recently, farmers and activists in permaculture design and in sustainable agriculture have been reintroducing predator-driven graze patterns to help regenerate agricultural lands. These patterns, set by millions of years of evolution, are now mimicked by humans on farms to move herd animals through various terrain. This work is perhaps best illustrated by the work of Joel Salatin at Polyface farm (see Polyfaces) and Mark Sheppard at New Forest Farm (see his book Restoration Agriculture or the film Inhabit). The principle of understanding why traditional graze patterns is simple: if you’ve ever visited a chicken run or petting zoo, you see what happens when animals are fenced in the same area for a long period of time. They first eat their favorite food, then nibble down to the less desirable greenery, and finally, eat whatever is left, leaving bare soil. This is what happens in a stationary system, rather than one driven by predators. Rather than fencing animals in the same spot, folks like Salatin and Sheppard carefully rotate their herd animals among large tracts of land in traditional grazing patterns. Mark Sheppard has his system so effectively designed that every different animal (cows, pigs, geese, chickens) move through a patch and quickly out of it in only a few days time. As the herds are rotated, each animal gets it’s own best “first bite.” This technique encourages the grass to stay alive, and to shed carbon (as the grass is bitten down, it sheds roots to accommodate it’s smaller size, and that sinks carbon into the topsoil, enriching it). This, friends, is why prior to the settling of the USA by Europeans, the prairies had soil horizons that were 12 feet deep of rich topsoil: it was millennia of herds moving quickly through areas, driven by predators. Predators, then, are responsible for herd movements that can literally sequester carbon and stop climate change. Farmers interested in regenerative agriculture are using these same methods to sequester tens of thousands of pounds of carbon each year. Salatin has compelling evidence tha if every US farmer who raises any grazing animal used these techniques, we could sink all of the carbon the USA has ever emitted in less than 10 years. This is the power of the predator, and this one of many reasons that they are deserving of our respect. There are other examples of this as well. I’m sure that many of you saw the video about Yellowstone Park, where it was shown that the re-introduction of wolves changed the whole ecosystem because of the movement of herds. The wolves were able, as the video suggests, change the movement of herds, which changed rivers, and helped regenerate the entire ecosystem. (There are some new articles that suggest that this video exaggerates the claims a bit, but I am still inclined to believe that a whole ecosystem, with it’s predators intact, is a more robust and healthy ecosystem). Without predators as a part of the ecosystem, all suffer. The outer lessons, above, are clearer the more I write and think about them, but I would also like to spend a few moments on the inner lessons that the predators offer. I, like many, saw predators as a nuisance, as something to keep away, as something you don’t want to see flying above the skies or slinking through the grass. But predators have another message–they are awareness medicine. The hawks flying overhead made me better protect my chickens, and sent me a powerful message about defenses, about being vigilant, and about not letting my guard down. If my chickens were the tastiest plump morsels around (and they are, they are made of chicken), then I had to change my own relationship with the predators and protect my chickens better. If I lose a chicken to a hawk, this is not the fault of the predator, this is my own lack of vigilance. The badger who broke into my coop, and dragged my beloved rooster off never to be seen again, sent me the message that I was to return to PA to my beloved mountains, a message I have since enacted in my life. The magic of my homestead worked because of my rooster, Anasazi, and without him, I knew it wasn’t going to work in the same way. That powerful message was the last thing I needed to truly move forward in my life. And the bear, who easily took out the beehive during the first evening, and even more skillfully worked his way through wire, rebar, straps, and more, teaches me the lesson that the predators need to be honored. To be respected. They are there, they are present, and there is no getting around their message. They are there whether or not we want them to be. And it is me, not them, who needs to change my own thoughts and actions . The lessons of the predator are many: power, strength, vigilance, loss, opportunity, precision, healing, defenses, paying attention, cultivating awareness and openness to your surroundings. Friends, readers, what are your experiences with the predators? Do you have any additional lessons to share? I wanted to spend some time in my blog describing a journey I took last summer to see “the source” of a river. My work with the OBOD Druid grade initiated this journey, and it lead me to important insights about our world and how to create meaningful change in it. Behind my parent’s house, in the forest to which I belong, is a creek (not quite a river, and not quite a stream). As children, we called it the “big crick”, and we spent much time on its banks, watching it flow over rocks, moss, and between hemlocks, beeches, and maple trees. 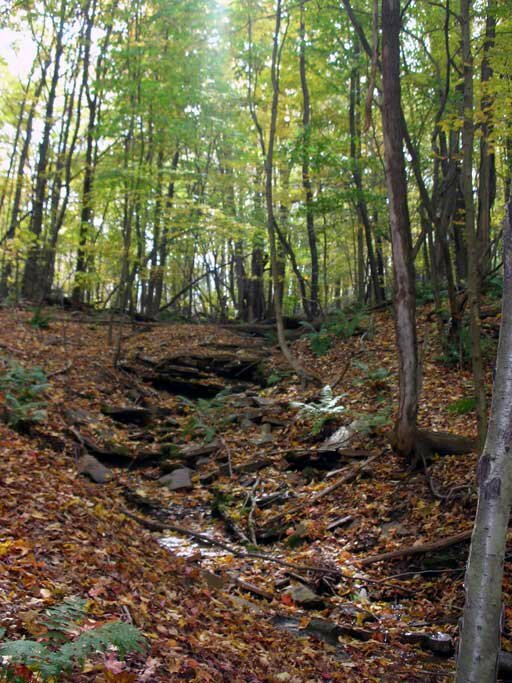 This creek was located in the Appalachian mountains in West-Central PA, and unfortunately, the forest has been logged repeatedly, damaging the land in numerous ways. And yet, damaged, logged, and repeatedly violated, the spirit of the land is strong and has much to teach. When you follow a river to its source, follow the water’s path upstream and take the largest of the tributaries each time the river splits. This gives you a unique perspective, in that you can witness how the river, at its current size, is built of smaller tributaries. These tributaries, some permanent springs and other rain gullies and other seasonal contributors, aren’t just part of the river—they are the river. If you follow the river to its source, you will learn that each river starts off as a tiny stream or freshwater spring; the river only later grows larger as other tributaries feed into it. Each one of us is that stream; each one of us has the potential of that spring that starts the river off. It is only through the power of others, flowing together in unison, that we can be a river. The strength of a great river cannot be ignored—it shapes the landscape around it and brings significant change. We must unite, have a shared vision, and be that river. The “Big Crick” is otherwise known as “Otto Run” and is located in Western Pennsylvania behind my parent’s home. This river has particular significance in expanding the general metaphor, so I’ll describe it here. Otto Run flows into the Little Conemaugh, which is a river of historical importance in my region’s history. The Little Conemaugh was once dammed up in the 1800’s, and in 1889 after severe rains and equally severe mismanagement of the dam, the dam burst and the resulting wave of water killed almost 3000 people in Johnstown, PA. This in itself has many lessons to teach us, including the importance of working with nature, rather than trying to tame her and bend her to one’s own will; she may resist such taming and break free. The Little Conemaugh flows into the Conemaugh which flows into the Allegheny, which meets in Pittsburgh, PA with the Monogahela to form the Ohio. The Ohio leads right into the Mississippi river, one of the largest and most important rivers in the USA. Each of these rivers, with their many tributaries, creates the mighty Mississippi. And as our recent series of floods in 2011 and droughts in 2012 have demonstrated, despite the best efforts of many humans, the Mississippi cannot be tamed. This too, is a lesson for us. In these difficult times of struggle and environmental challenges, we must look to the lesson that the river teaches us. Each of us is that tributary, and by flowing in unison, we become as strong as the Mississippi. And nobody can stop the Mississippi. So friends, remember the lesson of the river. United, we are strong. United, we can change this world into a better, more sustainable place.